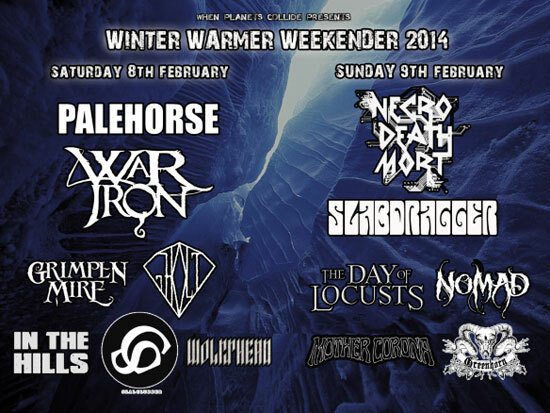 Headlining the Saturday we welcome back their friends in PALEHORSE, after signing to Candlelight Records and several high profile gigs, WPC say it truly is an honour to have these guys back! They shall be joined by another 2 Bassist noise behemoth in the form of Ireland’s WAR IRON, after a massively well received set at this years Desertfest it will be good to have them back on our shores. Main support on Sunday welcomes the return of SLABDRAGGER to the Windmill! WPC have had these boys a number of times but this time they are louder and larger than life with recently playing Damnation Festival alongside our Saturday headliners so it won’t be long before you will not be seeing bands like these in a venue of this size. On the Sunday we are massively excited to have the electronic doom duo NECRO DEATHMORT. This is one band that has to be seen to be believed and WPC have been trying for some time to have these boys involved so it will be a magnificent end to the weekend. This week is your last chance to pick up an advance ticket for just £10 admitting you to both days! Grab yours from the WPC webstore HERE and there’s also a Facebook Event set up HERE.